Well, that was one heck of an opening weekend to the 2015 season, wasn’t it Tribe fans? Three consecutive losses to the Detroit Tigers. Twenty-five runs given up. Forty-three hits allowed. Miguel Cabrera (a .786 batting average, two home runs and six RBI) doing everything short of helping himself to the Tribe’s post-game buffet. Michael Brantley battling a “perplexing” injury to his back. 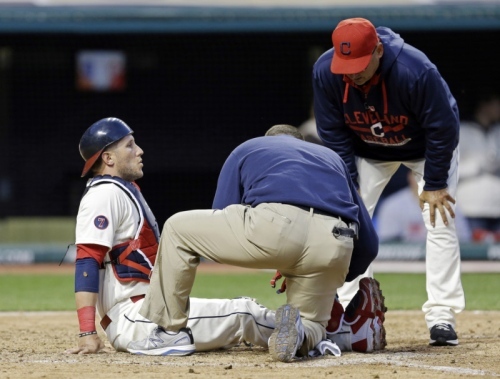 Yan Gomes going down with a knee injury that will keep him out a couple of months. We mean, even the Cleveland Browns managed to win their home opener. And the Browns didn’t lose their third home game until four months into the season. And Cleveland’s undisputed No. 1 team didn’t see attendance fall off by 35 percent from the first game of the season to the second. It was only three games and the season is just six games old. This is still the same Tribe team that looked good in taking two of three from Houston to open the season. The weekend feels worse than it was because of the over-importance people place on the home opener and the first weekend of the series. The Tribe may not be as good as they looked at times last week in Houston, but neither are they as bad as they looked over the weekend against the Tigers. If they get solid starts from Carlos Carrasco and Trevor Bauer in the two-game series against the White Sox, and a typical Corey Kluber outing on Friday night in Minnesota, and suddenly this weekend series doesn’t feel quite so bad. The one aspect that will linger for a while is that the three-game beating came at the hands of the Tigers, who have owned the Tribe – along with the A.L. Central Division – for the past few years. If the Indians are serious about contending for a playoff spot this season, they simply have to find a way to stop being the Tigers’ punching bag. They’ll get another chance to do that in a couple of weeks when they head to Detroit for a weekend series. Until then it is important to remember that it’s extremely difficult to lose a division or a playoff position during the first weekend of the season. No matter how hard the Indians tried this weekend to do just that, hope is not loss. No matter how much it felt like it was over the weekend.